Is this an alien? Just what the heck are we looking at? 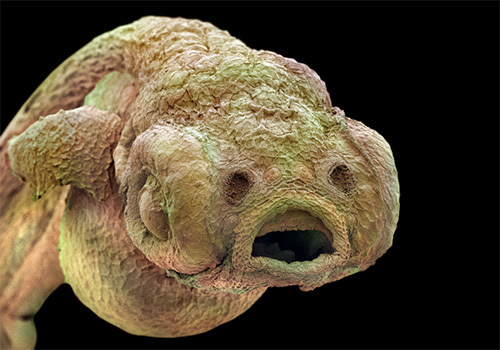 Here's a scan of an electron microscope image taken by Annie Cavanagh and David McCarthy: A zebra fish larva 32 hours after hatching from its egg. Zebra fish are one of the fundamental cornerstones of cancer, cardiovascular, immune system, infectious diseases and drugs research in laboratories all over the world. It is important! Who knew something so alien could be so important.